By: Henry Nowicki, Charles Carr, Richard Capp, George Nowicki, Wayne Schuliger. GAED or Gravimetric Adsorption Energy Distribution was used to determine pores or adsorptive spaces in filled and un-filled in by adsorbates in a real application. Comparisons of activated carbon (AC) pores before use and after use were GAED evaluated. Knowing pores filled in used AC can help select best AC for specific applications. Modern advanced activated carbon performance testing with GAED started with Polanyi Heterogenous Adsorbents Model like activated carbons1. The Polanyi heterogenous physical adsorption model is best suited to characterize activated carbons, because it can provide isotherms for specific compounds of interest at any temperature desired. Isotherms provide best carbon and amount of AC to satisfy the application2. Polanyi defined "pore" as the "adsorption space" and thus divorced himself of size and shapes of pores. Polanyi defined the amount of energy needed to remove an adsorbate from an adsorption space to the bulk as adsorption potential energy (APE). He stated the APE was independent of temperature and state of aggregation – this was the bridge between gas-phase and liquid-phase physical adsorption. PACS Laboratories has developed an automated instrument to fully characterize physical adsorbents like activated carbons. Over 6,000 samples have been run on the Gravimetric Adsorption Energy Distribution or GAED test method to obtain full sorbent characterization. A GAED full characterization is presented. PACS GAED Or Gravimetric Adsorption Energy Distribution instrument consists of four connected parts: 1- Sample compartment designed to run powder-granular-pelleted and AC fabric materials between 300°C and -20°C with thermistor in sample for continuous temperature monitoring during continuous weighing of samples and standard AC runs, 2- PACS invention challenge gas 1,1,1,2-tetrafluoroethane (TFE) because AC force fields do not affect outer shell valence electrons in TFE, 3- Computer program acquires TFE adsorption/desorption weight data, incremental temperatures from 240°C to -20°C (for adsorption) and -20°C to 240°C (for desorption), 4- Interpret quasi-equilibrium adsorption data from 500 TFE adsorptions and desorptions to represent all data with 30 data points in Table 1, 5- Printer to provide 26-30 page client reports on client sample(s) and comparison to benchmark commercial AC standards, Coconut-, wood-, coal-, and lignite-AC standards. Archival records maintained. Gravimetric Adsorption Energy Distribution, or GAED, was coined and championed by PACS to differentiate PACS AC testing services beyond ASTM methods and their limitations3. Nowicki’s team built a GAED instrument, because his previous employer Calgon Carbon Corporation has one known as TACTIC3. Only PACS provides services for all audiences, because GAED is BEST way to evaluate activated carbons performance. Because it reveals the best AC for each application and how much AC you need to solve specific problems. Polanyi (1914-1920) provided original innovative seminal conceptual thinking for Heterogeneous Physical Adsorbents like activated carbons, way ahead of his time in early 1900’s. Many notable scientists like Manes, Dubinin (1960), Greenbank (1982-2017), and others have modernized this model and Nowicki provided instrumentation and software to run over 6,000 GAED client samples. GAED provides experimental isotherms for any organic compound at any desired temperature for gas- or aqueous- carbon applications. Wow! GAED provides 9 orders of concentration on X-axis and 3 orders of adsorbate loading on Y-axis for isotherms. Whereas, ASTM iodine and butane activities use near saturation challenges to get a single-point adsorbate loading. Most activated carbon clients have real-world adsorbate challenges well below saturation, so GAED is relevant and ASTM is not. This is why GAED testing is growing! GAED test method is relevant to clients. Many AC scientists focus on BET surface area and pore size distributions, BUT they cannot provide isotherms. PACS provides BET surface area and pore size distributions during GAED testing, BUT does not emphasize them because they cannot provide isotherms, like GAED provides vapor and aqueous isotherms. PACS has also used tetrafluoromethane (TFM) in place of TFE to make it more useful to reveal less than one nanometer wall-to-wall pores. TFM will be used in Phase II. These smaller pores are needed for capacitors and carbon dioxide, methane, and vinyl chloride capture. GAED is a cheap instrument. A typical GAED run consists of loading 1-2 grams into sample compartment and heating to 250°C in argon to clean sample and holding 20 minutes, recording 250°C weight loss as a measure of sample cleanliness. This TGA weight loss data is part of the GAED report. 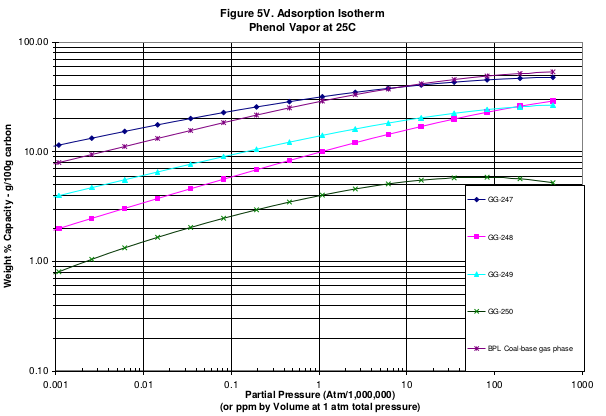 The 250°C cleaned sample is then challenged with TFE or 1,1,1,2-tetrafloroethane and sample weight gains at quasi- equilibrium are recorded with decreasing temperatures to reveal the nano-sized adsorption spaces with 29 cal/cc adsorption energy density in sample to 0 cal/cc adsorption energy densities. 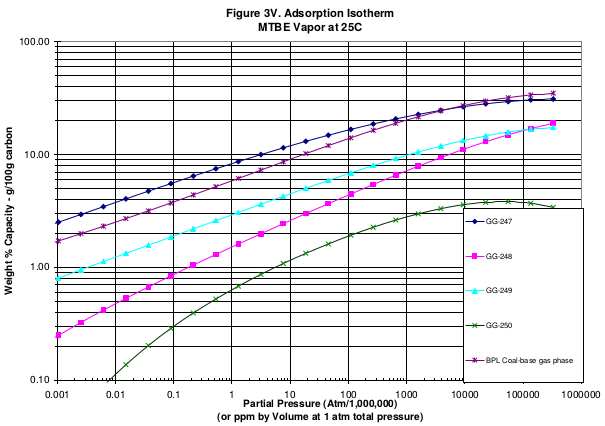 An automated temperature program incrementally lowers sample temperature to -20°C, this avoids TFE condensation on sample, and acquires some 500 X/M data points, weight gained X, per sample mass M. With adsorption curve completed a desorption curve is obtained by reversing temperature program. Five hundred adsorption and five hundred desorption data points are averaged and computer selects 30 data points in Table 1 to represent 500 acquired data points. 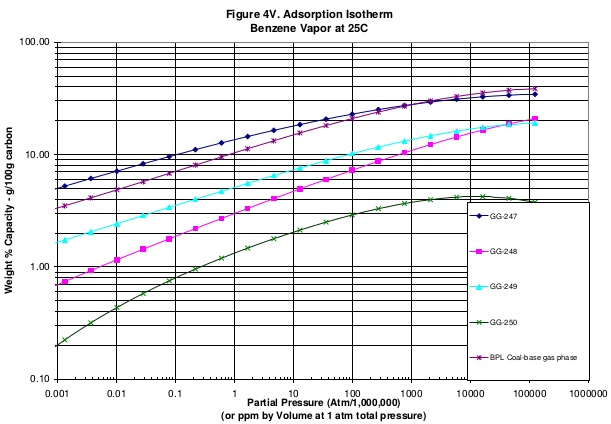 In Table 1, adsorption and desorption data files are averaged to get quasi- equilibrium values, to reveal any sample hysteresis. 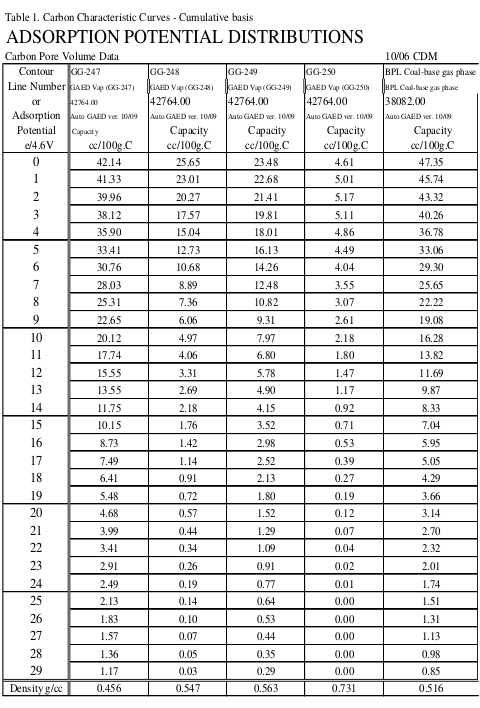 This Table of interpolated average adsorption and desorption is called Characteristic Curves for Sample and commercial benchmark coconut-AC and coal-AC standards is shown; see Table 1 with columns and rows. Characteristic Curve data is converted to third order polynomial equations to provide pore volume in cc/100g or cc/100cc carbon as a function of adsorption potential energy in cal/cc in full GAED reports. This enables a preliminary relative market survey for tested samples and standards for AC applications, because Polanyi model enables isotherms for any organic compound at any desired temperature; this is not obtainable by classical BET Surface area or pore size distributions. GAED has solved many client activated carbon problems that were refractory to ASTM and Standard Methods. 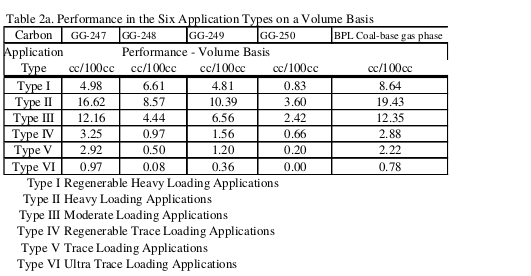 Anyone interested in activated carbon performances is advised to learn about what GAED can do for them. Four (4) samples, two un-used and two used, were GAED analyzed to determine pores filled and un-filled. All four samples were dried at 150 o C with ASTM D-2854-05. These densities are provided in last row of Table 1. In order to obtain accurate organics identification on carbon they must be desorbed into a solvent. The best eluting solvent is benzyl alcohol. 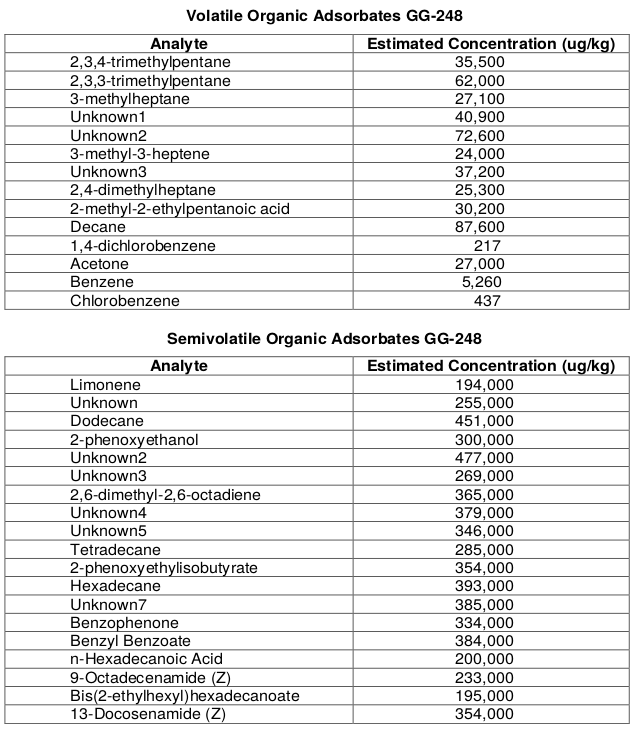 This method was used for identification of volatile organics and semi-volatile organics data below. GAED advanced full characterization performance testing for aqueous- and vapor- activated carbon applications. GAED provides isotherms for any organic compound of interest at the application temperature. GAED solves problems that cannot be solved by any other method than GAED. This article described use of GAED to determine pores filled and un-filled and mass spectral identification of adsorbates. 1. Polanyi, M. Verh. deut. physik. Polanyi, M. (1914). Verh. Deut Physik , Ges. 16, 1012. 2. Manes, M. (2010). Activated Carbon Adsorption Fundamentals. Except from Encyclopedia of Environmental Analysis and Remediation. Editor: Robert A. Meyers. John Wiley and Sons Inc. P. 26-58. Henry Nowicki provides Manes document as Primer for his two-day course on GAED. 3. Nowicki, H., Greenbank, M.